MOST of our electricity needs are met by fossilised remains of plants called coal. But the formation of this rock was halted around 300 to 360 millions years ago. Why? Nobody knows. Now scientists say a type of fungus called white rot may be the culprit. Coal is mostly made up of lignin. The material is the most important component of the plant cell wall and gives wood its strength. Lignin is usually left behind after fungus eats away rest of the plant matter. The study conducted by a team of 71 researchers from 12 countries found that white rot fungi, which are the only types of microorganisms that can break down lignin, evolved around 300 million years ago, coinciding with the end of the 60 million-year period during which all coal deposits were made. “The synchrony between the rise of white rot fungi and the close of the Carboniferous era was no coincidence,” said researchers in a statement. White rot breaks down lignin using enzymes. It destroyed huge accumulations of woody debris that otherwise would not have decayed and instead would have fossilised into coal, they added. To derive the conclusions, researchers studied 31 fungi of class Agaricomycetes. 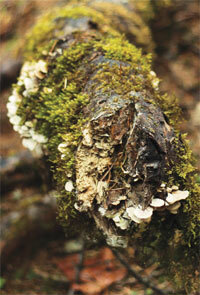 These included white rot fungi, which can digest all components of plant biomass—cellulose, hemicellulose and lignin. Edible mushrooms also belong to the same class. The researchers then built a fungal family tree and determined when the fungi evolved. The study was published in the June 29 issue of Science. The findings are important as the ability of white rot fungi to decay lignin can be used to produce biofuels. The fungi can breakdown the cell walls. This would then release cellulose, which could then be broken down into sugar by the fungi. The sugar can then be fed to yeast that would be fermented into alcohols and provide bases for new biofuels.